Wales coach Warren Gatland hopes his side's historic 12-6 win over South Africa can herald a successful start to their 2015 Six Nations campaign. The European tournament kicks off with 2015 World Cup hosts England's visit to Cardiff's Millennium Stadium on Friday, 6 February. "We've got the Six Nations now and we've got to look forward to that Friday night match here against England," Gatland said. "And that is going to be a big match." Wales also face England, as well as Australia, Fiji and Uruguay, in their World Cup pool. "They don't make it easy on coaches, I can tell you that. I couldn't watch the last couple of minutes." Gatland went into Saturday's game against South Africa having been criticised for a record of one win in 27 games against major southern hemisphere nations. The New Zealander said of his side's efforts: "I thought our fitness was excellent, we didn't fall off anything. "There are still things we have to work on, but we got the win and we desperately needed it." Gatland said his players' habit of losing close-run games against major southern hemisphere nations made for fraught emotions in the dying minutes against the Springboks. "They don't make it easy on coaches, I can tell you that," Gatland said. "I couldn't watch the last couple of minutes. "It wasn't a relief… it wasn't if it was going to happen [a win against one of the southern hemisphere big three], it was when it was going to happen." It was only the second time Wales had ever beaten South Africa, the previous victory coming in 1999. "We deserved that win today and in terms of relief and people talking about pressure, we thrive on pressure at this level. That's what it's all about," Gatland added. "The autumn series is about playing the best teams in the world, there's no competition points at stake, and for us it's about the Six Nations and preparing for that. The Welsh players celebrate at the final whistle in Cardiff. It was only their second win over the Springboks in 30 matches. "We were looking at this almost as a World Cup camp in terms of long-term preparing for the World Cup and that's the focus we had, and we're very happy with how the whole autumn campaign transpired." In their other autumn internationals this month, Wales pushed world champions New Zealand hard before conceding three late tries to lose 34-16, were narrowly beaten 33-28 by Australia and were also 17-13 winners against Fiji. "We pushed the three best teams in the world right to the end. 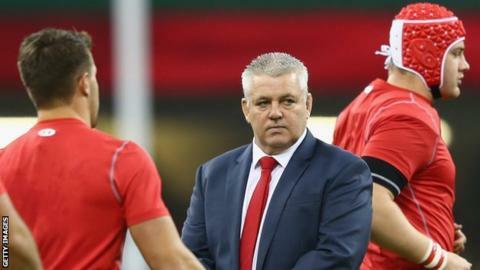 In two games we were leading and weren't able to finish it off," Gatland said. "Today we made it a little bit hard on ourselves, but we deserved the win. "It was nice to win and we wounded one of the big beasts today, but they'll be back." Captain Sam Warburton said beating South Africa was "right up there with my best achievement in a Welsh shirt".